Professor Stelios Andreadis from SUNY Buffalo and his colleagues have, in a series of elegant experiments, shown that the gene Nanog can stimulate dormant cellular processes that seem to be vital for preventing weak bones, clogged arteries and other telltale signs of aging. The findings might help counteract premature aging disorders such as Hutchinson-Gilford progeria syndrome. “Our research into Nanog is helping us to better understand the process of aging and ultimately how to reverse it,” said Andreadis. In order to delay or even reverse the ravages of aging, the human body holds a reservoir of nonspecialized progenitor cells that can regenerate organs. These cells are collectively called “adult stem cells,” and they are in every tissue of the body. Adult stem cells can rapidly respond to tissue damage to regenerate and heal organs and tissues. Unfortunately, as people age, fewer adult stem cells pare able to properly perform their function. This leads to the clinical scenarios associated with aging. Reversing the effects of aging in adult stem cells – re-booting them if you will – can potentially overcome this problem. Andreadis and his coworkers have previously shown that the capacity of adult stem cells to form muscle and generate force declines with age. Specifically, Andreadis and others examined smooth muscle cells found in arteries, intestines and other tissues. In this new study, grad student Panagiotis Mistriotis introduced a gene called Nanog into aged stem cells. He found that Nanog activated two key cellular pathways that include Rho-associated protein kinase (ROCK) and Transforming growth factor beta (TGF-β). Activation of these two signaling pathways awakens dormant proteins like actin to build the new cytoskeletal networks that adult stem cells need to form contracting muscle cells. Force generated by these cells ultimately helps restore the regenerative properties that adult stem cells lose due to aging. “Not only does Nanog have the capacity to delay aging, it has the potential in some cases to reverse it,” said Andreadis, who noted that introduction of the Nanog gene worked in three different models of aging: cells isolated from aged donors, cells aged in culture, and cells isolated from patients with Hutchinson-Gilford progeria syndrome. Additionally, Andreadis and his group found that Nanog activated the central regulator of muscle formation, a signaling protein called serum response factor (SRF), which suggests that the same results may be applicable for skeletal, cardiac and other muscle types. Andreadis and others are now examining potential drugs that can replace or mimic the effects of the Nanog gene. This will allow them to study the consequences of aging inside the body can also be reversed. This could have implications in an array of illnesses, everything from atherosclerosis, high blood pressure, and osteoporosis to Alzheimer’s disease. This fascinating paper was published here: Panagiotis Mistriotis et al., “NANOG Reverses the Myogenic Differentiation Potential of Senescent Stem Cells by Restoring ACTIN Filamentous Organization and SRF-Dependent Gene Expression,” Stem Cells, 2016; DOI: 10.1002/stem.2452. A research team at the Icahn School of Medicine at Mount Sinai has utilized a mathematical modeling to simulate the delivery of human mesenchymal stem cells to a damaged heart. In doing so, they found that a particular subset of harvested MSCs minimizes the risks associated with this therapy. This study represents a development that could lead to novel strategies to repair and regenerate heart muscle and might even improve stem cell treatments for heart attack patients. In the United States alone, one person suffers a myocardial infarction or heart attack every 43 seconds (on the average). The urgency of this situation has motivated stem cells scientists and cardiologists to develop novel therapies to repair and regenerate heart muscle. One of these therapies includes the implantation of human mesenchymal stem cells (hMSCs). However, in clinical trials the benefits of hMSC implantation have often been modest and even transient. This might reflect our understanding of the mechanism by which hMSCs influence cardiac function. Kevin D. Costa and his colleagues at the Icahn School of Medicine have used mathematical modeling to simulate the electrical interactions between implanted hMSCs and endogenous heart cells. They hoped to eventually understand the possible adverse effects of hMSC transplantation and new methods for reducing some potential risks of this therapy. Implanted hMSCs can disrupt the electrical connections between heart muscle cells and can even cause the heart to beat irregularly; a condition called “arrhythmias.” One particular type of hMSCs, however, did not express an ion channel called EAG1 (which stands for “ether-a-go-go”). The EAG1-less hMSCs did not cause arrhythmias at nearly the rate as the EAG1-containing hMSC, in computer simulations run by Costa’s group. These EAG1-less hMSCs, also known as “Type C” MSCs, minimized electrochemical disturbances in cardiac single-cell and tissue-level electrical activity. The benefits of these EAG1-less hMSCs may enhance the safety of hMSC treatments in heart attack patients who receive stem cell therapy. This advance could therefore lead to new clinical trials and future improvements in treatment of patients with heart failure. Costa’s study might provide a template for future computational studies on mesenchymal stem cells. It also provides novel insights into hMSC-heart cell interactions that can guide future experimental studies to understand the mechanisms that underlie hMSC therapy for the heart. This work was published in Joshua Mayourian et al., “Modeling Electrophysiological Coupling and Fusion between Human Mesenchymal Stem Cells and Cardiomyocytes, PLOS Computational Biology, 2016; 12 (7): e1005014. DOI: 10.1371/journal.pcbi.1005014. Scientists have been very interested in the details of stem cell differentiation. To that end, several laboratories have designed hydrogels that mimic the stiffness of biological tissue in order to grow stem cells and study their differentiation. In one enterprising laboratory, led by Rein Ulijn of the City University of New York and the University of Strathclyde, scientists have used a novel culture-based gel system to study mesenchymal stem cell differentiation and identify those metabolites used by stem cells when they select bone and cartilage cell fates. When these molecules are provided to standard stem cell cultures, these molecules can guide stem cells to generate desired cell types. This new study illustrates how new biomaterials can provide an exacting model system that can help scientists precisely determine those identifying factors that drive stem cell differentiation. Stem-cell scientists have known that the rigidity of a hydrogel surface can instruct stem cells to differentiate. A rigid surface, as it turns out, can result in bone cell formation, whereas soft surfaces induce the differentiation of cells into neuron-like cells. With this information, Ulijn and others developed a protocol that generates gels by combining small building-block molecules that spontaneously form a network of nanosized fibers. Furthermore, by varying the concentration of these building blocks, the stiffness of these gels can be adjusted. By mimicking the stiffness of bone (40 kilopascal) or cartilage (15 kilopascal), the gel stimulates stem cells applied to its surface to differentiate accordingly. The available gels for growing stem cells are typically derived from animal products. Unfortunately, this can affect the reproducibility of results, since different preparations of particular animal products can have rather different properties. Synthetic components usually require coatings or coupling of cell-adhesive ligands. However, the gel developed by Ulijn’s group is composed of two simple synthetic peptide derivatives. One component binds to copies of itself with high directional preference, which results in the spontaneous formation of nanoscale fibers when the molecules are dissolved in water. 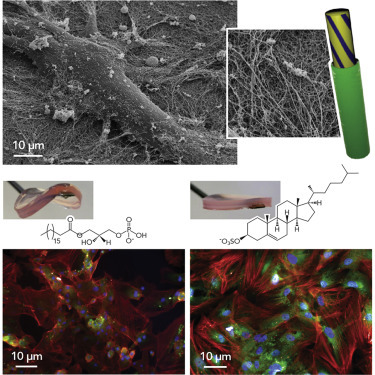 The second components consists of a surfactant-like molecule that binds to the fiber surface and presents simple, cell-compatible chemical groups to any cells. The components are held together by relatively weak and reversible interactions, e.g., hydrogen bonding and aromatic stacking. Interestingly, variants of these gels are commercially available through a spinoff company called Biogelx, Ltd., where Ulijn serves as chief scientific officer. Particular transcription factors are often the ingredients scientists use to induce stem cell fate in the case of induced pluripotent stem cells. However, Dalby and Ulijn think that certain metabolites might drive those pathways that cause the different intracellular concentrations of transcription factors that drive the various differentiation pathways. One metabolite featured in the study is cholesterol sulfate. Cholesterol sulfate is used up during osteogenesis on a rigid matrix and can also be used to convert stem cells into bone-like cells in cell culture. In their paper, Ulijn and his coworkers showed how small molecules, like cholesterol sulfate, can put into motion those cell-signaling pathways that culminate in the activation of the transcription factors that drive the transcription of major bone-related genes. The expression of these bone-specific genes drives bone formation, and this demonstrates a connection between the metabolites and the activation of transcription factors. It must be noted that this gel does not precisely recapitulate the microenvironment inside the body. Therefore, it is unclear if the stem cells grown on it behave differently on the designed gel surfaces than they would in the body. Although the full list of metabolites derived from the analysis is preliminary, “it could certainly point researchers in the right direction,” Ulijn said. “Our ambition is to simplify drug discovery by using the cell’s own metabolites as drug candidates,” Dalby said. This paper was published here: Alakpa et al., “Tunable Supramolecular Hydrogels for Selection of Lineage Guiding Metabolites in Stem Cell Cultures,” Chem, 2016 DOI:10.1016/j.chempr.2016.07.001. Ever scraped your knees or elbows? It’s a good thing that they didn’t stay that way, since human skin readily renews, heals wounds, and regenerates the hair that covers it thanks to a resident population of stem cells. These cells continually produce new ones. Depending on someone’s age, the complete skin is renewed every 10-30 days. A new study led by Salvador Aznar Benitah (Institute for Research in Biomedicine, Barcelona, Spain) has identified two proteins that are integral to the conservation of skin stem cells. Without these proteins these skin-based skin cells are lost. The proteins identified, Dnmt3a and Dnmt3b, trigger the first step of the genetic program that leads to stem cell renewal and regeneration of the skin. “Without them (i.e. Dnmt3a & Dnmt3b), this program is not activated and the stem cells collapse and disappear from the tissue,” said Benitah. Dnmt3a & 3b are enzymes that attach methyl groups (-CH3) to the cytosines in DNA molecules. The full name of these enzymes, DNA (cytosine-5)-methyltransferase 3A, catalyze the transfer of methyl groups to specific CpG structures in DNA. This process is known as “DNA methylation.” These particular DNA methyltransferases participate in de novo DNA methylation. They must be distinguished from so-called “maintenance DNA methylation,” which ensures the fidelity of replication of inherited epigenetic patterns. Epigenetics refers to cellular and physiological trait variations that result from external or environmental factors that switch genes on and off and affect how cells express genes, but do not involve changes in nucleotide sequences, but in chemical modifications to DNA or higher-order structures of DNA. DNMT3A forms part of the family of DNA methyltransferase enzymes that includes DNMT1, DNMT3A and DNMT3B. 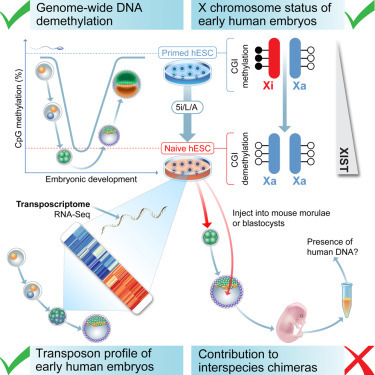 While de novo DNA methylation modifies the information passed on by parents to their progeny, it enables key epigenetic modifications essential for processes such as cellular differentiation and embryonic development, transcriptional regulation, heterochromatin formation, X-inactivation, imprinting and genome stability. Lorenzo Rinaldi, a graduate student in Benitah’s laboratory who was also the first author of this study, has mapped the regions of the genome that houses the genes that encodes these two proteins. Rinaldi and others have shown that Dnmt3a & 3b affect gene expression by methylating “gene enhancers” and “superenhancers.” Gene enhancers and superenhancers are sequences that tend to be far away from genes but still have the ability to increase the speed of gene expression up to 200-fold. “It was surprising to see that two proteins that have always been associated with gene repression through DNA methylation are activated in the most transcriptionally active regions of stem cells. We had never observed this activity because we were unable to study the global distribution of Dnmt3a and Dnmt3b at the genomic level. Thanks to advances in sequencing techniques, more researchers are observing the very mechanism that we have described,” said Rinaldi. Of the 12,000 gene enhancers in the genome, about 300 are superenhancers related to stem cell activity. Dnmt3a & 3b activate expression of the approximately 1,000 genes that are required for the self-renewing capacity of stem cells. By methylating the superenhancer, these proteins trigger the first step of the machinery that leads to the amplified expression of these essential genes for the stem cell. Dnmt3a and Dnmt3b clearly associate with the most active enhancers in human epidermal SCs. The expression of Dnmt3a & 3b is also altered in cancer cells. Cancer cells tend to show altered DNA methylation and altered gene enhancers that affect gene expression. The mass sequencing of tumor cell genomes has provided these observations. Dnmt3a and Dnmt3b activities are altered in many types of tumor, including leukemias, and cancers of the lung and the colon. “Each of these three components is associated with the development of various kinds of cancer. Given that these proteins activate gene expression enhancers through DNA methylation, we believe that it would be of interest to study them in cancer cells in order to determine whether they participate in tumor development,” said Benitah. 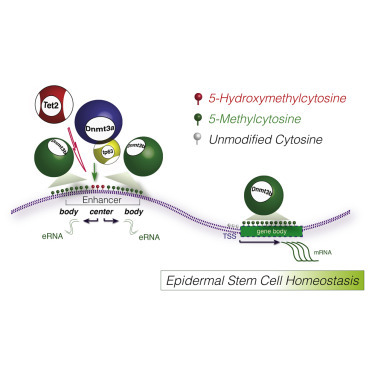 This work appeared in: Lorenzo Rinaldi et al., “Dnmt3a and Dnmt3b Associate with Enhancers to Regulate Human Epidermal Stem Cell Homeostasis,” Cell Stem Cell, July 2016 DOI: 0.1016/j.stem.2016.06.020. Regulating the internal pressure of the eyeball (known as the “intraocular pressure” or IOP) is crucial for the health of the eye. Failure to maintain a healthy IOP can lead to vision loss in glaucoma. However, a new set of experiments by Dr. Markus Kuehn and his colleagues at the Iowa City Veterans Affairs Medical Center and the University of Iowa has shown that infusions of stem cells could help restore proper drainage for plugged-up eyes that are at risk for glaucoma. Kuehn and his coworkers injected stem cells into the eyes of laboratory mice suffering with glaucoma. These infused cells regenerated the tiny, fragile patch of tissue known as the trabecular meshwork, which functions as a drain for the eyes. When fluid accumulates in the eye, the increase in IOP can lead to glaucoma. Glaucoma damages the optic nerve leads to blindness. “We believe that replacement of damaged or lost trabecular meshwork cells with healthy cells can lead to functional restoration following transplantation into glaucoma eyes,” Kuehn wrote on his lab’s website. One potential advantage of the approach is that induced pluripotent stem cells (iPSCs) could be created from cells harvested from a patient’s own skin. That gets around the ethical problems with using fetal stem cells. It also lessens the chance of the patient’s body rejecting the transplanted cells. In order to differentiate iPSCs into trabecular meshwork (TM) cells, Kuehn’s team cultured the iPSCs in medium that had previously been “conditioned” by actual human trabecular meshwork cells. Injection of these TM cells into the eyes of laboratory rodents led to a proliferation of new endogenous cells within the trabecular meshwork. The injected stem cells not only survived in the eyes of the animals, but also induced the eye into producing more of its own TM cells, thus multiplying the therapeutic effect. Glaucoma has robbed some 120,000 Americans of their sight, according to data provided by the Glaucoma Research Foundation. African-Americans are at especially high risk, as are people over age 60, those with diabetes, and those with a family history of the disease. Glaucoma can be treated with medicines, but is not curable. Management of the disease can delay or even prevent the eventual loss of vision. Among the treatments used are eye drops and laser or traditional surgery. Kuehn and his team think that their findings show some promise for the most common form of glaucoma, known as primary open angle glaucoma. It remains unclear if this mouse model is as relevant for other forms of the disease. Another possible limitation of this research is that the new trabecular meshwork cells generated from the stem cell infusion eventually succumb to the same disease process that caused the breakdown in the first place. This would require re-treatment and it is unclear whether an approach requiring multiple treatments over time would be viable. Kuehn and others to continue investigate this potentially fruitful approach. This paper was published in the journal Proceedings of the National Academy of Sciences: Wei Zhu et al., “Transplantation of iPSC-derived TM cells rescues glaucoma phenotypes in vivo,” Proceedings of the National Academy of Sciences, 2016; 113 (25): E3492 DOI: 10.1073/pnas.1604153113. B vitamins called folates can stimulate stem cell proliferation independently of their role as vitamins. This is according to a collaborative study from the University of Georgia and Tufts University, which used a cell culture system in addition to a live animal model system to establish these results. Folates, whether supplemental B vitamins or natural folates found in food, are an essential cofactor for single-carbon transfer reactions. Folates are integral for the proper functioning of all cells in the body and are critical to prevent birth defects, in particular defects of the neural tube (spinal cord). This study shows, for the first time, that an adult stem cell population is controlled by an external factor arising from outside the animal. The animal model system was the small, free-living roundworm, Caenorhabditis elegans. Is this the case for human stem cell populations? Difficult to say, but it surely can’t hurt to make sure that you are getting enough folate in your diet. This work was published in this article: Snehal N. Chaudhari et al., “Bacterial Folates Provide an Exogenous Signal for C. elegans Germline Stem Cell Proliferation,” Developmental Cell, 2016; 38 (1):33 DOI: 10.1016/j.devcel.2016.06.013. Researchers from the Salk Institute for Biological Studies in La Jolla, CA and collaborators from Ecole Polytechnique Fédérale de Lausanne in Switzerland and Massachusetts Institute of Technology in Cambridge, Massachusetts have developed a new benchmark for generating the most primitive type of stem cell. These new molecular criteria can allow scientists know just how close laboratory-generated “naïve stem cells” mimic embryonic blastomeres that exist in the very earliest stages of human development. Naïve stem cells potentially have a greater ability to differentiate into a wider variety of tissue types. They might have many different applications for research and regenerative medicine. Mature human bodies have their own adult stem cells populations. However, these stem cell populations have the capacity to differentiate into a subset of different cell types (multipotent), or only one cell type (unipotent). Stem cells derived from embryos are pluripotent, which means that they can differentiate into any cell type in the adult human body. Likewise, adult cells that have been subjected to particular genetic engineering and cell culture techniques can be reprogrammed into pluripotent stem cells known as induced pluripotent stem cells or iPSCs. These have many (although not all) of the characteristics of embryonic stem cells. Several different research groups have developed cocktails of molecules that can de-differentiate pluripotent stem cells into cells that resemble cells from postimplantation embryos. Essentially, these protocols can effectively turn the clock back on pluripotent stem cells to make them resemble naïve stem cells, or those blastomeres that are found in preimplantation embryos only days after fertilization. Naïve stem cells are “totipotent,” which means that they can differentiate into any cell type in either the adult body or in the embryo, including placenta. These cells constitute the primordial cells that produce all the cells of the human body and those that make up the placenta as well. Most of the published protocols to generate so-called naïve stem cells, however, are rather inefficient. They tend to produce cells that are very much like the starting pluripotent cells and produce few changes in gene expression. The Salk team and their collaborators used a battery of molecular tests on these “primed” cells and embryonic stem cells (ESCs) that had been exposed to factors that are thought to induce the naïve state. Their experiments compared gene expression in ESCs with ESCs that had been subjected to the laboratory protocols to convert them into naïve stem cells, and blastomeres from early embryos. The discovered that three main tests were the most indicative of the differences between naïve stem cells and other stem cells. First, they measured the expression levels of transposons, DNA sequences that can jump around the genome. It was clear that the expression of transposons provided a sensitive measure of the similarities pluripotent stem cells and early human development. In fact, naive human ESCs shared a unique transposon signature with cleavage-stage embryos, and the expression of certain transposons was indicative of naïve stem cells. Next, they found that the genomes of naïve embryonic stem cells have less methylation (the addition of methyl chemical groups or –CH3 groups – to the bases of DNA. They then examined the state of X chromosomes in naïve cells of female embryos’, which contain two active X chromosomes, unlike more mature embryonic cells that have silenced one of the X chromosomes. These three tests collectively include tens of thousands of genetic biomarkers to characterize the developmental state of stem cells. When current methods for generating naïve stem cells in the lab were judged using the three tests, each fell short of fully mimicking the naïve embryonic cells in different ways. One new technique, for instance, led to cells that had two active X chromosomes but didn’t match the exact methylation patterns desired. In fact, none of the current, published protocols lead to truly naïve stem cells. These established guidelines may help researchers achieve that goal and eventually elucidate where the current methods fall short. Generating naïve stem cells would be a boon to both basic research and to medical applications of stem cells. The analysis provided in this paper is likely to become a gold standard for quality control of stem cells, including induced pluripotent stem cells, regardless of their use in research or in clinical applications. See Rudolf Jaenisch et al., “Molecular Criteria for Defining the Naive Human Pluripotent State,” Cell Stem Cell, July 2016 DOI: 10.1016/j.stem.2016.06.011.